The Secrets Pope Francis Don’t Want You To Know! – Dr. Turi M.D.U.S. THIS POPE WILL NOT SAVE THE CHURCH INC. AND THE VATICAN HIS TAIL OF THE DRAGON (NEGATIVE) IN THE 7TH HOUSE (THE PUBLIC) WILL BRING TERRIBLE “PUBLICITY” TO THE PSYCHICALLY ABUSIVE CORPORATION – YOU MUST LISTEN TO THE ENTIRE SHOW ITS ALREADY HAPPENING. MORE DETAILS ON POPE FRANCIS FATE UPON MY RETURN FROM MY SEDONA EVENT! I am SAGITTARIUS, child of Jupiter. I will soon divulge all the secrets of his UCI and why Pope Francis IS the last Pope in the Vatican! this is only part one ONLY my VIP’s will get the goodies, Join us be informed! Before getting into Pope Francis’ secrets, health and fate let me point out a few things making up the news reflecting my predictions involving the current Scorpius Dragon effect on humanity. (CNN) — A band of furious teenagers hurled bottles, bricks and trash cans at New York police Wednesday night, days after police shot and killed an armed Brooklyn youth. The fact is the Scorpius Dragon is forcing a “wake up call” to the police that will have to re-structure with its abuses and all was published last year in my 2013 Moon Power and still posted on my website. While they are billions of psychics and practicing astrologers in the world, if you have no access to a well documented record predictions, you are dealing with deceptive Neptunians who can not differentiated between imagination and real cosmic wisdom. Thus by offering you the obvious dated, printed and published predictions I am not enjoying an ego trip but assuring you, the source is very real and worthwhile your trust! Prediction page 1– 17. The Dragon’s Head in Scorpio, (police/local governments), will force the police itself to realize its own limits of power as to avoid its own collapse. Serious internal/external police abuses / secrets will make the news and direct public challenges will kill many police officers. Many police Chiefs /FBI/CIA executives will be entangled in a secret deal that will bring disgrace and a serious wake up call for all. 2012/2014 could become a death record for the police and many new public Leaders will take on the challenges to bring justice and protection to the people. Many will be found assassinated. Another one of my 23 set of prediction came to pass and I am sure this one will get your attention reflecting the Taurus ($$$$$$/bank/credit cards) negative Dragon’s Tail. If you recall in “The Stars and Fate of Hugo Chavez” I explained in great details how he was assassinated and today the news again proved me right “Maduro: Scientists will study possible Chavez poisoning” while my 2013 Moon Power currently read about drugs ” Lifesaving drugs run short in Greece“, religions and all was foreseen this well before the old Pope was “removed” from office giving room to the new elected Pope Francis! But what honorable Pope Francis’ Neptunian “blessings” are offering you that can be of a good use for your daily life reader? The satisfaction that now God is in your side and will protect you and your loved ones? If you believe so so be it but rest assured the fact is; a good chunk of the people he blessed won’t be around next week and many will endure the current dramatic Scorpius Draconus impact and this is a fact! Isn’t time for human to wake up to the reality of tragedies because you can not hear, see or heed the God’ signs? The least you should expect from a God’s elected official that “deal or talk to God” is solid and obvious divinity, but where is it? Why does it not show and where is the Pope’s guidance reflecting a real divine interstellar communication? Is Dr. Turi more informed, more aware, more Godly than the Pope himself if he can perform predictive “miracles” on a daily base? But even with the full facts in hand the God fearing lost souls will still refuse to understand or accept I offer my readers much more than all the Popes and Saints combined together have ever offered you with. Something so Godly, something so rare and so precious that really speak TONS of God’s divinity can and will save or better your life! But what will I get from all those God fearing cosmic unconscious lost souls? ENVY AND JEALOUSY and of course the title of the most egocentric man walking this planet who thinks he is better than the Pope himself! But the very fact is too obvious, I am in fact much closer to God than the Pope himself can ever be and translate his celestial will with authority, confidence an undeniable accuracy! Yes they missed my own Godly message because they are far from being ready for the “New God” cosmic reality induced by the New Age of Aquarius. They still drag their feet in the 2000 years old deceptive archaic altered teachings of the Illuminati jailing their body mind and spirit giving them full access to their pockets! It amazes me that the smallest corporation in the world managed to hijack 99.09% of all human spirits and still practice very successfully their shameful Popes’elective masquerades. And you wonder why this world is so chaotic and dangerous? Why this planet I call HELL is run by fear, greed, manipulations, political and religious controlled information? When ‘When Friends Turn Enemies” and when those who call themselves “Light Workers” who like me are in a spiritual mission to help the world find my work to harsh and too real to deal with or when other lost souls cant comprehend the Divinity I own it really make my cursed mission to free your spirit from fears and cosmic ignorance as heavy as the cross Jesus had to carry on his back! Amazing how I feel the same pain trying so hard to make you aware of what happened to the 3 wise men cosmic legacy, eradicated by the controlling Illuminati 200 years ago. God and Jesus Speak To Me! I elaborated so much on the new elected Pope fate and shortcomings in my March 13th 2013 cosmic code radio show did you miss it? But Mercury, the planet regulating radio and communications is still retrograde and you will have to be patient to enrich your spirit with more of my rare wisdom. I WILL POST THE BEST PARTS AND THE LONG EDUCATIONAL MATERIAL FOR MY VIPS ONLY ON THE COSMIC CODE ONLY GROUP! JOIN NOW MASTER THE COSMIC CODE! In 2001, upon becoming cardinal, Bergoglio “discouraged people from spending the money to fly to Rome to celebrate with him and advised that they instead donate the funds to help alleviate poverty at home.” He lived in a simple apartment, cooked his own food, and traveled by bus instead of a chauffeured limousine. However, Bergoglio has been criticized by the Society of Jesus (Jesuits) for his behavior during the 1976-1983 dictatorship in Argentina, with some journalists claiming that he prevented human rights groups from finding political prisoners by imprisoning them in his vacation home. During the period of the dictatorship, the Catholic Church failed to confront the regime, even as it was kidnapping and killing thousands. 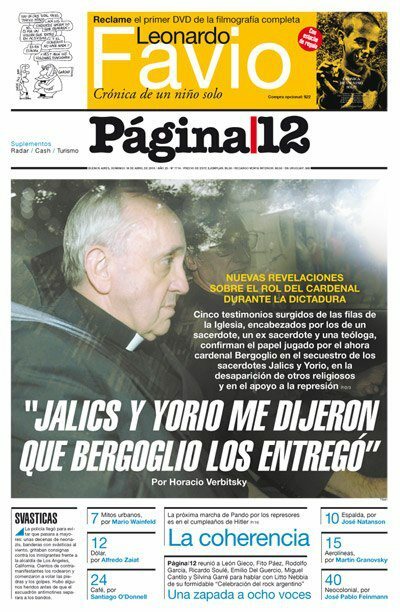 The church eventually issued a blanket apology for its actions in October of 2012, though Bergoglio “invoked his right under Argentine law to refuse to appear in open court” to address two cases in which he was directly involved. When he did testify in 2010, his “answers were evasive,” human rights activists claim. He later became bishop and archbishop of Buenos Aires. Pope John Paul II elevated him to the title of cardinal in 2001 – When the military junta relinquished power in 1983, the duly elected president Raúl Alfonsín set up a Truth Commission pertaining to the crimes underlying the “Dirty War” (La Guerra Sucia). 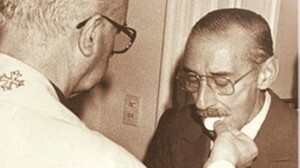 One of the key appointments of the military junta was the Minister of Economy, Jose Alfredo Martinez de Hoz, a member of Argentina’s business establishment and a close friend of David Rockefeller. The neoliberal economic policy package adopted under Martinez de Hoz was a “carbon copy” of that imposed in October 1973 in Chile by the Pinochet dictatorship under advice from the “Chicago Boys”. Wages were immediately frozen by decree. Real purchasing power collapsed by more than 30 percent in the 3 months following the March 1976 military coup. (Author’s estimates, Cordoba, Argentina, July 1976). The Argentinean population was impoverished. The Order of Jesus –which represented the Conservative yet most influential faction within the Catholic Church — closely associated with Argentina’s economic elites– was firmly behind the military Junta, against so-called “Leftists” in the Peronista movement. Bergoglio, who at the time was “Provincial” for the Society of Jesus, had ordered two “Leftist” Jesuit priests “to leave their pastoral work” (i.e. they were fired) following divisions within the Society of Jesus regarding the role of the Catholic Church and its relations to the military Junta. Condemning the military dictatorship (including human rights violations) was a taboo within the Catholic Church. While the upper echelons of the Church were supportive of the military Junta, the grassroots of the Church was firmly opposed to the imposition of military rule. Had Jorge Mario Bergoglio taken a similar stance to that of Cardinal Raul Silva Henriquez, thousands of lives would have been saved. The Church was involved in supporting the military Junta. This is something which will emerge in course of the trial proceedings. No doubt, there will be attempts to obfuscate the role of the Catholic hierarchy and the newly appointed pope Francis I, who served as head of Argentina’s Jesuit order during the military dictatorship. The election of Pope Francis I has broad geopolitical implications for the entire Latin American region. 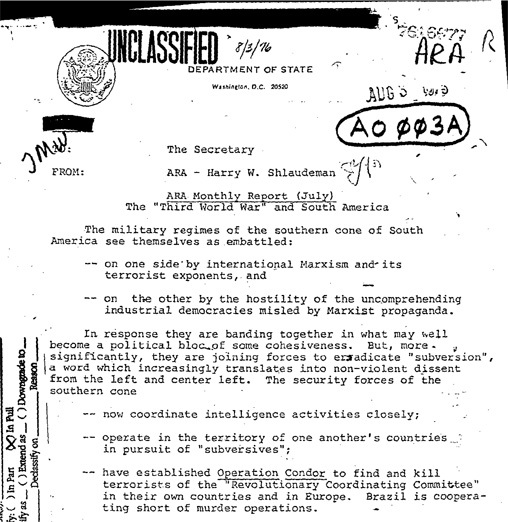 In the 1970s, Jorge Mario Bergoglio was supportive of a US sponsored military dictatorship. The Catholic hierarchy supported the military government. Wall Street’s interests were sustained through Jose Alfredo Martinez de Hoz’ office at the Ministry of Economy. The Catholic Church in Latin America is politically influential. It also has a grip on public opinion. This is known and understood by the architects of US foreign policy. In Latin America, where a number of governments are now challenging US hegemony, one would expect –given Bergoglio’s track record– that the new Pope Francis I as leader of the Catholic Church, will play de facto, a discrete “undercover” political role on behalf of Washington. With Jorge Bergoglio, Pope Francis I in the Vatican (who faithfully served US interests in the heyday of General Jorge Videla) the hierarchy of the Catholic Church in Latin America can once again be effectively manipulated to undermine “progressive” (Leftist) governments, not only in Argentina but throughout the region, including Venezuela, Ecuador and Bolivia. 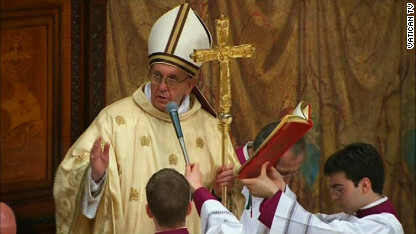 This instatement of “a pro-US pope” occurs a week following the death of president Hugo Chavez. 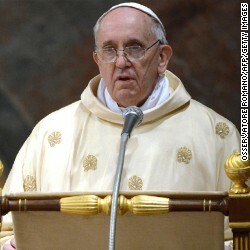 Washington’s Pope in the Vatican? Were pressures exerted by Washington on the Vatican conclave leading to the instatement of a pope who will faithfully serve US foreign policy interests in Latin America? Michel Chossudovsky was Visiting Professor at the Social Policy Institute of the Universidad Nacional de Cordoba, Argentina at the outset of the military regime in 1976. His major research focus at the time was to investigate the impacts of the deadly macroeconomic reforms adopted by the military Junta. He was teaching at the University in Cordoba during the initial wave of assassinations which included “progressive” members of the Catholic clergy. He also witnessed how the Catholic hierarchy supported the military junta. In 1973, Michel Chossudovsky was Visiting Professor at the Institute of Economics, Catholic University of Chile, Santiago de Chile.